After relaxing holidays with my family, I’m back to work. I always have mixed feelings about the holidays coming to an end—I love the family time, but I also am excited to get back to work and to create new things for 2018. I find that when work (and everything for that matter) is going best, there is a natural flow of energy from my activities to others, a natural path from the internal to the external and then back again. I’ve seen a number of new year planners that focus entirely on what the individual wants to manifest in the new year. What is lost from this, often, is an understanding of the individual within a larger frame. We live in a world that is more and more focused on the individual, a world that is losing a sense of community. But no one exists alone. When we focus on what we want individually without having community around us, we often get farther from what will really make us feel happy, fulfilled and healthy. This isolation of the individual is one of the reasons so many writers are often unhappy: writing in our culture is often solitary work. And it’s often part of a competitive world, in which we live within a mindset of scarcity: there is a limited amount of “greatness” that only a very few of us can attain. That leaves the rest of us feeling unworthy and isolated. And I’ve noticed that even many writers who achieve a very high level of outward success still feel unworthy and insufficient. This sense of scarcity is a pyramid scheme where even those at the top live in fear of falling off with no supports. So how can we look forward to 2018 with a sense for our personal fulfillment and also a sense of communal wellbeing? I know many of us are working on—or want to be working on—creative projects. And I know that many of us often feel stuck, frustrated or uncertain about where we are going with the project—or just about being able. to really move forward in a meaningful way at all with it at all. Today I also want to emphasize community. It is important that we don’t feel isolated in the act of writing. Once we have established safe boundaries, we need to feel that our writing is a form of being in relationship to ourselves, to the world around ourselves, to our own voice, wisdom and vision and to that of others around us. Our writing—and living—works best when we can find a shared, common ground. First we must within ourselves: we can come out of our head alone and come into full, shared communication with our body and spirit so that we can witness ourselves with our whole self. And we can also find a shared common space with others: our writing—and living—works best when we can find a shared common ground with others. That community can be a teacher or coach, it can be a group of friends, colleagues, classmates, students, readers. *) How do you want to use your voice (in writing or otherwise) this year? *) Dream big: what do you most want to create/write? *) Who is the audience you are you creating your writing for? *) Who is supporting you in the process? *) What other supports could you put in place for yourself? These are important questions, and I want to offer you tools and support in the process of finding and reaching your goals. Those of you in the Boston area might want to consider my in person creative writing classes; I’m teaching a yoga and writing workshop this Saturday in Millis, MA; and my signature online course Align Your Story, that brings together the best of my teachings, will start again later this month. See more below. In all of these classes and workshops, we consider both craft and process, your individual voice and the larger framework in which you are writing. As always reach out with questions and feel free to share with any friends. 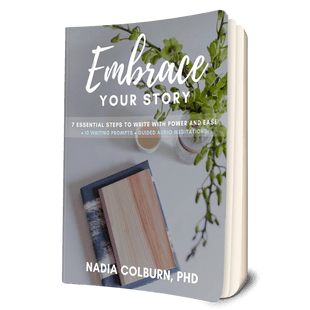 And at the bottom of this email, I’m sharing an article that I was delighted to be featured in, about my work at Align Your Story.